I had wanted to make it out to Sotto for awhile since it opened back in March, when it had taken over the space formerly occupied by the all-abuzz Test Kitchen, the establishment that was a literal revolving door for LA chefs to test out their menus on adventurous diners. Gone are the one- (and two- and three-) offs and in come Steve Samson and Zach Pollack – permanently. Sotto is the incarnation of Steve and Zach’s thankful relocation to LA from behind the Orange Curtain, and I am so glad they are here. With the inclusion of a stellar cocktail program making it an all-around solid place for food and drink, my pocketbook itself is thankful I’m not actually located on the Westside. Regardless, Sotto is a place I would gladly become a regular. 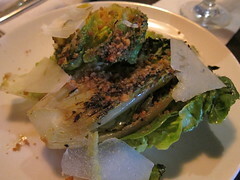 The Southern Italian dishes source Southern Californian ingredients beautifully – starting with a grilled salad enticingly called “Blistered Little Gems,” with anchovy garlic pestata, breadcrumbs, pecorino Moliterno. Yes, it’s a delicious warm salad, three words I never thought I’d ever have put together, but the way in which the flavored bread crumbs, anchovies and garlic gracefully season the still-crisp lettuce was an impressive, physics-defying feat. My knife cut through the greens as loudly as the crunch of the crumbs while bite after bite tickled my tastebuds. It was a starter that made me more than eager about what was to come. From the ravings from friends in myÂ Twitter feed, however, I had missed out on the most blissful yet simplest of starters: The housemade bread with lardo pestado. So – you’re hereby ordered to try that. I, on theÂ other hand,Â won’t make the mistake, again. 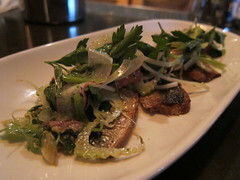 Next were the Sardines and Sicilian citrus salad, with shaved fennel in a crushed olive-pistachio vinaigrette. I loved how the salty skin of the sardines were complimented by the fennel and parsley, making the entire dish a medley of fresh and flavorful textures. 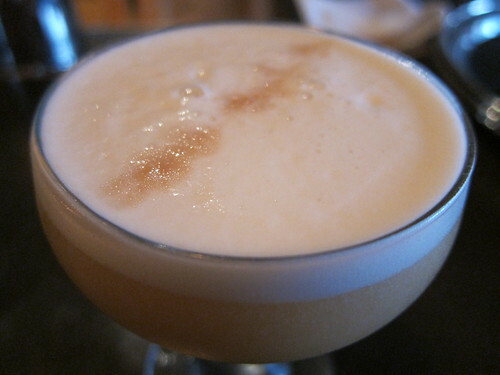 The grapefruit was the perfect citrus – not too sweet, a little sourÂ and adding nicely to the overall aroma. Fortunately, I was sitting next to a fellow lone diner at the barÂ and we had a pleasant, most appreciativeÂ time sharing bites. 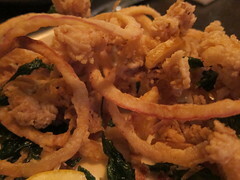 The calamaretti he ordered blew any standard issue fried calamari dish I’ve had anywhere else out of the water. The texture and flavor (complete with fried red onions) were perfection – and you will just have to try it yourself to understand what that’s about. 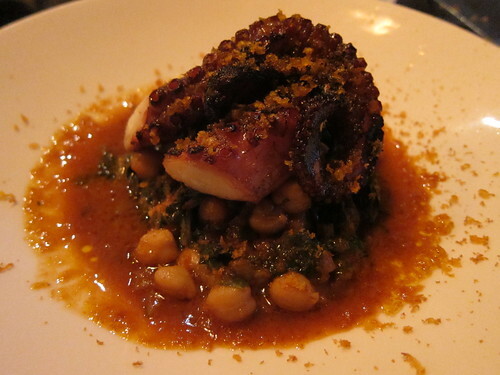 The Tomato-braised Octopus, which I specifically ordered since I heard it had been delivered that day, had a delicious, charred flavor on the outside of each tender bite. It no signs of chewiness often associated with this sea creature and really was the most interesting preparation I’ve had to date of octopus. The chickpeas did a great job of soaking up the rest of the sauce as the lemon and bottarga made for a perfectly seasoned dish. Sotto is solid. Its refinedÂ dishes come to your table (or bar seat) seamlessly executed. While the focus is Southern Italian, the flavors and texturesÂ are never tired and there is a noticeable attention to detail in every bite. Its locale on PicoÂ prevents it from attaining any sort of hype by proxy that so many other restaurants in L.A. have relied on (while its predecessor was essentially an upshoot of that very ingredient), so I commend this outpost of a grassroots-type restaurant that delivers impressive dishes to its diners. I can really sense Steve and Zach’s passionÂ emanating fromÂ that open-ish kitchen. SottoÂ better beÂ here to stay. My tastebuds demand it. This entry was posted in cocktails, Food, West L.A., wine and tagged blistered gems, calamaretti, calamari, cocktails, Italian, L.A., los angeles, octopus, Pico, Pico Robertson, salad, sardines, Sotto, Southern Italian, squid, Steve Samson, West L.A., wine, Zach Pollack. Bookmark the permalink.